Place chia seeds and almond milk into a medium bowl. Stir to combine and set aside for 15 minutes or until the chia seeds have bloomed (all the seeds absorb the liquid). 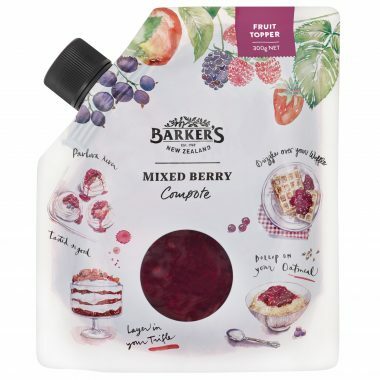 Mix 1 cup of yoghurt with 1/2 cup Mixed Berry Compote until combined. To assemble, divide remaining 1/2 cup of fruit compote between 4 jars or glasses. Top with remaining 1 cup of Greek yoghurt divided amongst the jars. Distribute half of the chia pudding mixture between jars and top with half of the yoghurt fruit compote mixture. 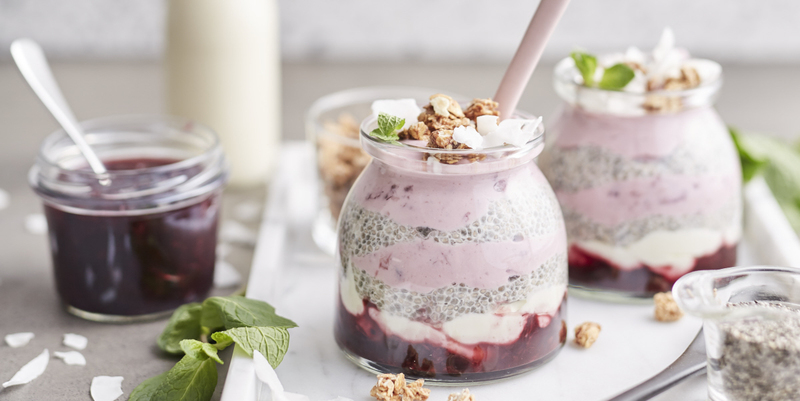 Repeat to add another layer of chia pudding and yoghurt fruit compote. Top with granola, flaked coconut and mint leaves. Serve immediately or keep chilled in the fridge until ready to serve, up to 2 days.